A fragment of cast copper-alloy metal working debris of uncertain date. It is triangular in form and section, terminating on at least two sides in old breaks. All surfaces are extremely worn, with only traces of a dark green/brown patina surviving. It measures 25.33mm in length, 14.87mm in width, 9.03mm in thickness, and 8.63g in weight. The precise function of this fragment remains uncertain. 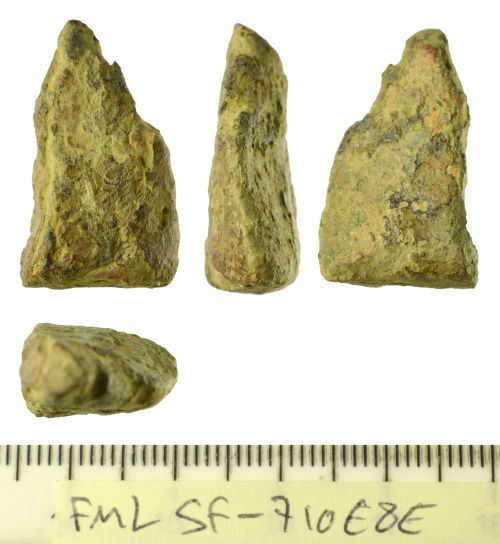 Its form is similar to the corners/edges of Bronze Age objects, such as socketed axes, and it is not implausible that this is a fragment from the corner of a cutting edge/blade. However, its poor preservation and breaks make this identification problematic and it might equally be a small fragment from a cooking vessel of later date, or simply waste product from metal working processes. It can therefore only losely be dated to the Bronze Age or later periods.